1. Values of electrical conductivity, pH and temperaturearound the perimeter of Sandy Lake on Aug 10, 2017. 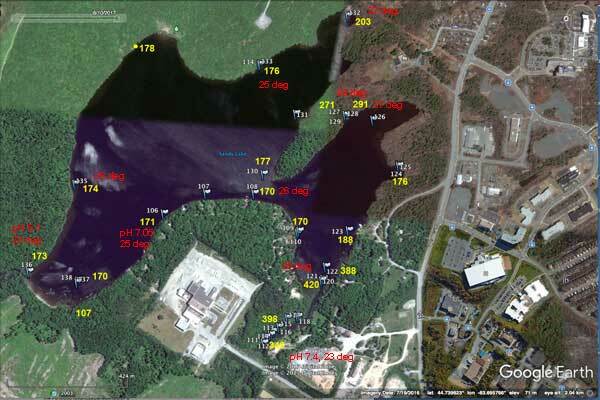 Above: Values of electrical conductivity (yellow numerals; units are uS/cm), pH (red) and temperature (red) of surface water at different locations on Sandy Lake on Aug 10, 2017. 2. Values of electrical conductivity, pH and temperature for surface waters on various dates in 2017. Above: Values of electrical conductivity, pH and temperature for surface waters on various dates in 2017. Note the higher EC values for streams on the west side of the lake than on the east side of the lake and, in general, that pH values for streams are lower than values for Sandy Lake (see also figure above) except for Bob’s Brook (also known as Johnson’s Brook; it enters the lake at the southwest corner of the lake) and Peverill’s Brook flowing to Marsh Lake. Above: EC and pH values for streams associated with Johnson’s (Bob’s) Brook on Nov 8, 2018. #1 Johnson’s Brook. #2 Brook draining from Uplands Park wastewater treatment area. #3 and # 4: Brook draining construction/trucking yard and community just to the SE of the Dairy Road. 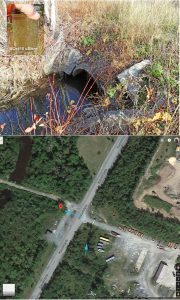 These 3 system converge in the area of sites 5& 6 and then water flows downstream to enter Sandy Lake through two large culverts at site #7. Nos 8 and 9 were taken at Sandy Lake Beach Park for reference. There were strong flows in the brooks at sites 1 and 2. 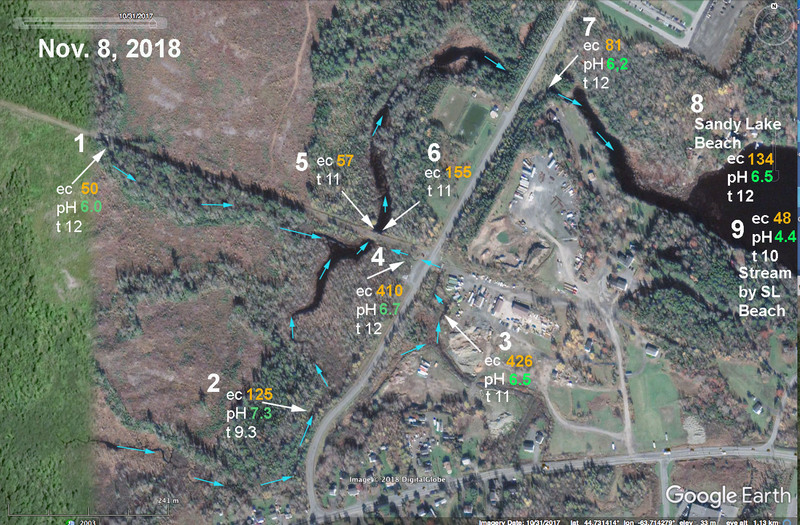 A steady but weaker flow was observed at site 3-4 (it crosses the road from 3 to 4 through a culvert and that water was very cloudy and had a lot of suspended material. 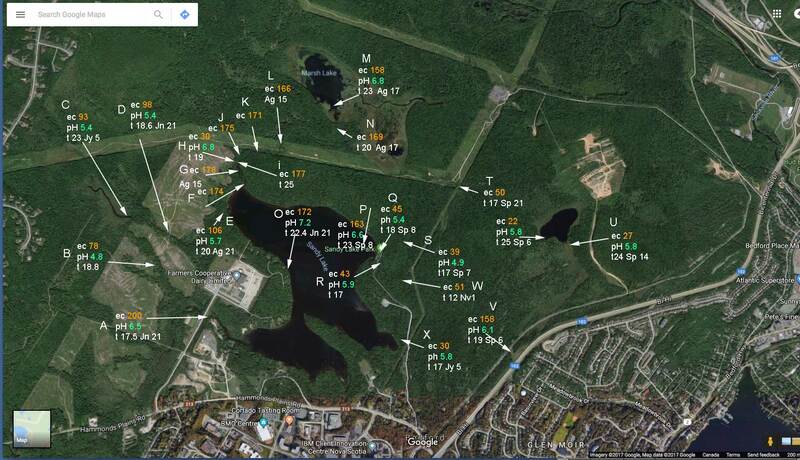 The EC value at the 2 culverts where the Johnson’s Brook system enter Sandy Lake was 81 uS/cm, much lower than the 200 uS/cm observed June 21, 2017, and reflects the high rainfall in the preceding month or so; likewise, the EC value at Sandy Lake Beach Park was 134 uS/cm on Nov 8, 2018, compared to 163 uS/c, on Sep 8, 2017. Three streams converge at “Murphy’s Pit” (see Map page 3 in Thompson 2001). 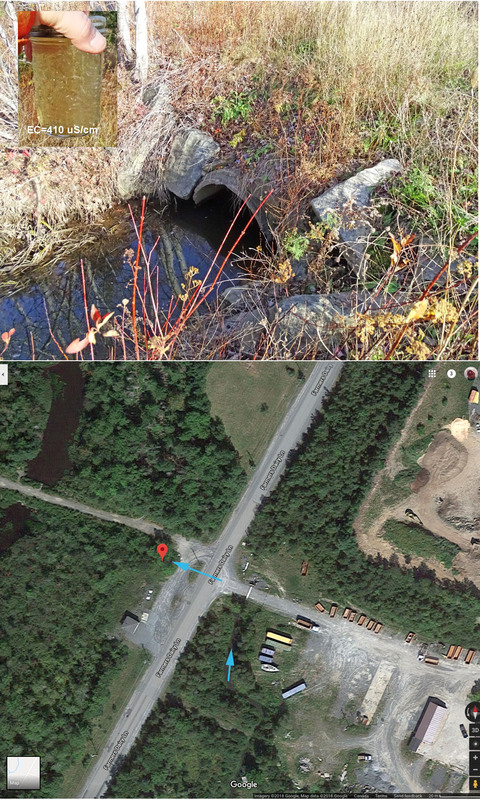 I estimated the volume of flow in Johnson’s Brook (#1 in map above) to be 3 x that in the stream draining the Uplands Park wastewater treatment area, and 20 times that draining the construction/trucking yard and community just to the SE of the Dairy Road. 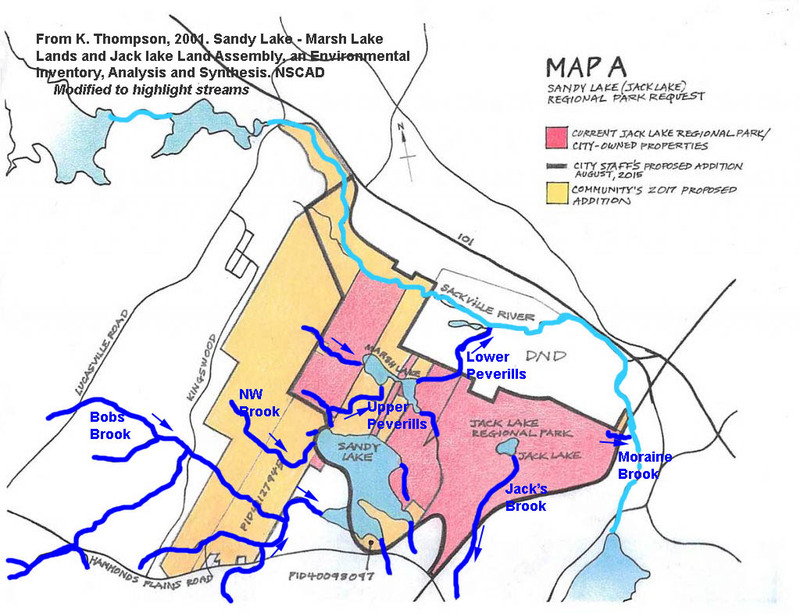 Johnson’s Brook had a very low EC value, while those of the other two brooks were elevated (125 uS/cm for #2, 410 uS.cm for #3/4); those streams are major sources of pollutants going into Sandy Lake. The sites above should be sampled in the winter when salt is being applied to roads. Also, the quality of water entering at site 4 (on Nov 8 with high electrical conductivity and very cloudy and full of particulate materials) should be further investigated. Is the cloudy water just temporary? What are the nutrient and bacteria levels? 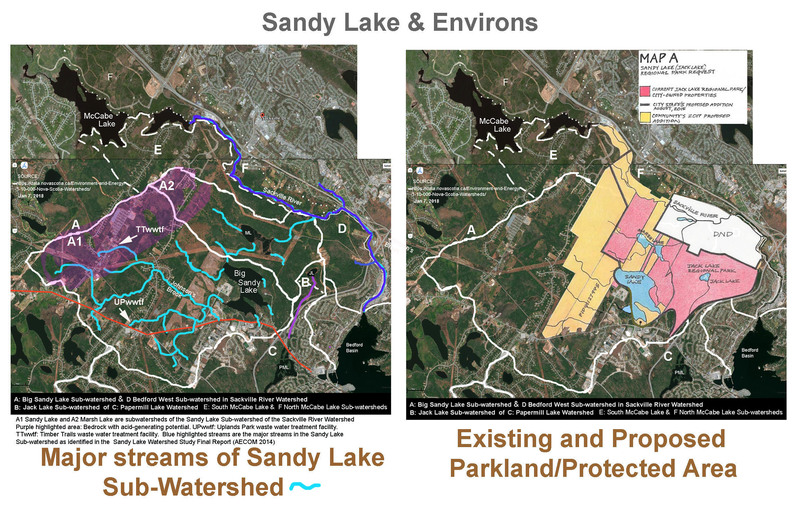 How does the flow rate change with seasons and relative to other flows into “Murphy’s Pit” and then into Sandy Lake, i.e. is it a significant source of pollutants for Sandy Lake? The maps below are for reference.